Writer-director Terry Gilliam is decades distant from Brazil and The Adventures Of Baron Munchausen, his most ambitious and troubled productions, and the ones that gave him a reputation as a difficult director. But his films are still problematic: His dark blend of vivid fantasy and disturbing reality is unmistakable, but it can be hard to endure. The last 15 years have seen him through financial successes (The Fisher King, Twelve Monkeys), mixed reviews (Fear And Loathing In Las Vegas), and one production that completely disintegrated (The Man Who Killed Don Quixote, documented in fascinating form in Lost In La Mancha.) Gilliam returned in 2005 with the overblown, awkward The Brothers Grimm, but now he's back with a much smaller and more personal film. True to form, Tideland is a gorgeous dark fantasy, featuring a child stranded in the countryside with only her doll heads, her imagination, and a peculiar family for company. Gilliam and The A.V. Club recently discussed whether Tideland is his best film or his worst, why he recently renounced his American citizenship, and what Sarah Polley thinks about him these days. The A.V. Club: When we last spoke three years ago, we talked at length about how dark your films are. But Tideland seems exceptionally grim. Do you see it that way? AVC: In that interview, you said you'd thought Brazil would appeal to college students, but they found it too dark, and it went over better with high-schoolers. Do you have a sense yet for who's mostly likely to appreciate Tideland? TG: No. Tideland's a really good one. I can't predict, I honestly can't. I've screened it enough times in enough places on this planet, and I know how it plays. I know some people switch just off very early on and run away. And others, from all walks of life, different ages, different sexes, all love it. Those who love it cannot see how anybody cannot. And those who dislike it can't see how anybody could ever watch it. [Laughs.] So it's very strange. I had a theory that women tended to like it quicker than men, because they can identify with Jeliza-Rose, not specifically her adventures, but her ability to deal with what life throws at her. That's been quite true. Young girls really like it, and I kept saying it could be the new Titanic, because teenage girls really responded to it. In Japan, it's doing incredibly well, it's been playing for 12 weeks in select theaters. The Japanese get it. It's an interesting one. When we were making it, I kept thinking, "This is a litmus test for the world today." AVC: The Japanese trailer and the American one are very different. The American trailer makes it look more like a pretty thriller, while in Japan, it's being marketed as Rose In Tideland, and the Alice-down-the-rabbit-hole aspect is more emphasized. AVC: Do you think it's being marketed correctly here? AVC: What would be the ideal individual response to the film? What would you like to have people walk out of it thinking? To be honest, I'd much prefer people to like it than not like it, but one of the things that did happen when we were editing—normally, when we pre-screen a film, I can talk to the test viewers afterward to get a sense of what they think. And we were finding people didn't really know how to talk about it yet. And we gave them an e-mail address and said, "When you're ready, write me." It takes some people five or six days, a week, before they got their thoughts in order. And then it was like, "God, it changed the way I look at the world," people would say. "It's made me completely re-examine how I think about things." And I thought, "Well, that's great. That's fantastic." They're all interesting responses. I think what has been most intriguing is, those who don't like it, don't want to really even talk about it. AVC: Well, if people don't enjoy a piece of art, it can be awkward to go to the artist and explain why. TG: No, but they don't have to go to me. They can do it publicly. I read the reviews, the bad reviews, and they don't even confront the film. I understand people not wanting to come and tell me they don't like it. But when I read the reviews and they're not even describing the film that was made, what are you talking about? If you're going to do the work, do the work. So that turned out interesting, because I thought we could maybe create a big public debate between various viewpoints on my film. But we're not getting the negative side in any kind of argumentative state. They just don't want to talk about it. AVC: How did you pitch such an extreme project? How did you get it funded? TG: Well, I read the book, and I thought, "Fantastic." I sent the book to Tony Grisoni, who I write with, he said, "Fantastic." We got it to Jeremy Thomas, the producer, he said, "Fantastic. Let's go." Easy. All of us, there weren't any qualms. We knew we were going to be pushing buttons, but they were all buttons worth pushing. Still, it proved very difficult to get the money, even though it was a low-budget film. One of the problems, we felt, was that men tend to control the money. I kept saying, "We're going to need a woman who's in charge of some money to get this film made." And that's in fact what happened. In Canada, a woman producer came on and the company called Telefilm, which was run by a woman, that's where we got the money. And they understood and loved the project, where men were slightly unnerved by it. AVC: Your last film, The Brothers Grimm, cost about $80 million to make, whereas Tideland cost about $12 million. But Tideland actually looks better on the screen. It's a luminous movie. How did you make it so cheaply? AVC: Tideland does use a lot of computer effects, though. TG: It's the scale of everything. The thing with Tideland is, you've got these beautiful exteriors. But we didn't build them—they were there. You just point a camera. And the places we chose are beautiful. The house, it's inside, it's dark, it's rotting, and it's a very small place. Doll heads only sit on the end of your finger. The scale is very, very small, and that's why it's cheaper. AVC: Is CGI in any way changing the way you approach films or put together individual scenes? TG: No. It's just one of the tools you can use. I'm doing more with it these days than I did before, because I'm just getting more familiar with it. AVC: What do you think about the way it's been changing how films are made, and how they look? TG: I just think everybody's just hiding behind it. You're putting on a lot of elaborate visuals there to cover up no story, no idea. I sometimes worry about it. I was talking just recently with somebody about King Kong, the early version, the first version, and then the Peter Jackson version. Peter Jackson's version is the pinnacle of technical achievement. It's stunning. It's phenomenal. And yet it doesn't have the magic of the original, and I think it's because all of the work is being done for you. It's like television. It's turning cinema into a passive experience, because you don't have to imagine anything. You don't have to use your imagination. Everything is there. In the original one, you've got this puppet running around. And you've got to use your imagination to make it a living creature. And then you're engaged, you're involved. It's like radio. If you're doing a drama on radio, you have to imagine. And I think that many could get people's imaginations functioning, exercising, they're in the film. The end result, the end experience, is much more rich. That was my feeling. That was the film that really got me thinking about what you do and don't do with CG work. AVC: Sarah Polley famously contacted you as you were working on Tideland to discuss how working with you on Baron Munchausen traumatized her. 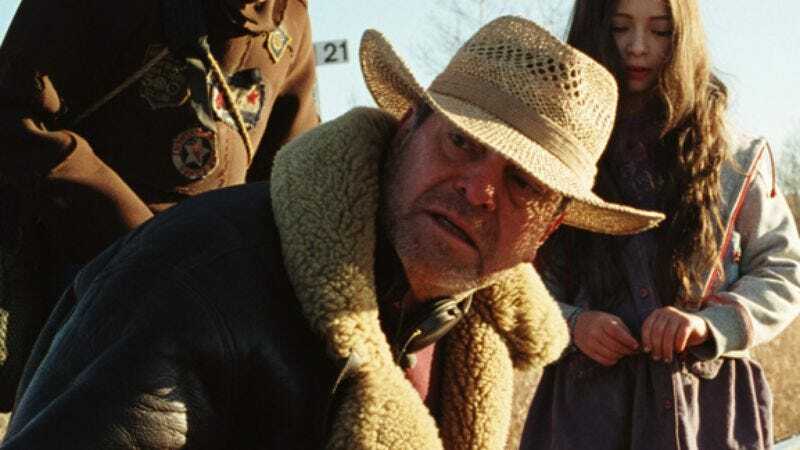 Did that exchange in any way change how you worked with Jodelle Ferland on Tideland? TG: I worked with her the same way I worked with Sarah when we did Munchausen. We go to work, we're professionals. The talk with Sarah was quite interesting, because by the end of it, she'd begin to say, "Well, it really probably wasn't the film. Actually, I was having problems with my parents back then." I said, "Sarah, there was nothing we were doing that would endanger you ever, because you were too central to the whole thing." And I said, "Sarah, you never gave me a hint you were anything but at ease with what we were doing. If I'd seen something, I wouldn't have done it." And it was very nice, because it was the first time I really talked to Sarah in a long time. It was nice to become friends again. Jodelle and Sarah were interesting in the same way. They both would have worked 12 hours a day if we could have worked them that long. They just loved what they were doing. Jodelle is, again like Sarah, incredibly intelligent, and in some ways, constantly surprising. I tended to not direct her. "There's the script, there's the situation, sit here, walk here," those kinds of things, but what you see up there are her choices on how that character responded to things. AVC: Tideland centers on a bunch of themes that are common in your work, particularly psychosis and imagination, and how they help people deal with life. Do you have any idea where your original interest in those themes comes from? AVC: At the same time, there's a huge body of scholarship about you and your films. Do the theories interest you when someone else is spinning them? AVC: In interviews, you've said that with The Brothers Grimm, you deliberately set out to make a commercial film. AVC: Did you personally do anything different to make it Brothers Grimm a commercial product? TG: I didn't. It was just within the story that was being told, the situation wasn't pushing as many buttons. It wasn't going into dark, strange, and disturbing territory for people. Even though, I must admit, there are scenes in it that really get people worried. [Laughs.] On nerves. I will always try to do that. But with Grimm, I was dealing with fairy tales. A lot of people were saying, "Oh, some of those scenes are too dark. Little girls being swallowed by horses and disappearing." But that's what happens in fairy tales. It's a fairy-tale world. To even get stranger—because this is the 25th anniversary of Time Bandits, they've put out a special edition. Time Bandits and Tideland are like two bookends. They're both about childhood imagination. They're both about children with less-than-wonderful parents. There are many connections. I keep wondering whether the world has changed or whether I've changed, because one is obviously much jollier and fun, and the other is darker. Time Bandits, I would argue, is maybe for children, while Tideland is for adults. But maybe it's the same film. AVC: Is it possible that the tonal differences between the films just come from 30 years of you growing up? TG: Probably. I'm more cynical, darker, more despairing, more prone to depression. All those things are there. That's why I when I watch Tideland, I actually find it a joyous experience. I'm laughing all the time. And that's what's interesting. I actually tell people it's a better film for most people the second time. The first time can be very on the edge of your seat. "Where is this going?" People are very uncomfortable, worrying about where I'm going to take them. And I don't take them where they're worried about, so the second time, they relax and enjoy it much more. My wife said it was shocking because it was innocent. For the American screenings—they didn't add this for the press screenings, which bothers me—I've actually done an introduction that goes out with the film when it's in cinemas. Because I've been doing so many festivals this year, and doing a little introduction, and people said, "Oh, the introduction helped me get into the right frame of mind for the movie." So I've actually done an introduction for the film when it's released. AVC: What do you say in that introduction? TG: Well, it starts, "Hello, I'm Terry Gilliam. I have a confession to make: Many of you are not going to like this movie." [Laughs.] Then it goes on from there. But basically, what I'm saying is, "Try for the next couple of hours to forget your prejudice, fears, and preconceptions that you have developed as an adult. Try to become innocent again. See the world through a child's eyes, and don't be afraid to laugh." AVC: You said earlier that you don't care what people come out of the movie thinking. Yet you feel the need to address people directly beforehand, and tell them how to approach it? TG: I know. It's weird. It only came out of the fact that I've been doing so many festivals, and so many people said, "Oh, thank you for doing this." It actually also came out—the reason I thought of doing this was, several years ago, when M. Night Shyamalan made Unbreakable, he came to London for a screening, and I was sitting in the audience, and he said the one reason he was inspired to make the film was, he thought, "What would happen if my dad was Superman? As a kid, I was so impressed with my father, and I actually did think he was Superman. What would happen if he really was?" Now, that isn't what he put at the beginning of the film. He wrote a note. There's a crawl at the beginning of the film about comic books. And that sends you down the completely wrong path. But I watched that film thinking "What if my father was Superman? ", and I really loved it because of that. And I knew so many other people who had seen the film, and they kept talking about comic books, and they missed the point. So I thought, "I don't like doing this, but let's do it. And we'll see what happens." AVC: When we spoke in 2003, you were in the process of trying to get back the rights to The Man Who Killed Don Quixote, and you thought it was just about to happen. Three years later, not much progress seems to have been made. What's the latest? TG: It's just about to happen! [Laughs.] It looks like we've actually got it this time. I know I'm the boy who cried wolf, but apparently a deal has been done, and we're waiting for the lawyers to do the fine print. Jeremy Thomas, who produced Tideland, seems to have pulled this thing off. But again, the other side of me isn't going to even think about it until the thing is my hands, and I know we own it. AVC: Why did you renounce your American citizenship earlier this year? TG: I thought I'd just simplify my life. I'm getting old. I'm gonna die. I'm not at all happy with what America has been in the last 10 years. [Laughs.] The reality is, when I kick the bucket, American tax authorities assess everything I own in the world—everything I own is outside of America—and then tax me on it, and that would mean my wife would probably have to sell our house to pay the taxes. I didn't think that was fair on my wife and children. AVC: Isn't it a little early to be thinking about dying? AVC: Maybe that explains why your films are grim. TG: Well, no. That's the wrong word, angry. I wasn't angry at all. Not in the least. It was just a factual thing. There was no way they were ever going to hire me. J.K. Rowling wanted me, the producer did, and they sent me out to L.A., but I actually went out there because it got me a free trip to deal with some lawyers on Don Quixote. There was no way I was ever going to make the film. I knew that. It shouldn't be seen that I was angry about it. It's just an acceptance of the reality of Hollywood. AVC: If they asked you to do one of those films, would you? TG: No. It's a factory job, is what it is. I don't like that. It's a big operation the way they run it now, and it's so heavily controlled by the studio, considering the kind of work I want to do. But it doesn't stop people on the web fantasizing about me doing the last one. AVC: Do you consider Good Omens your next project, or is there something else on the table?